Now that I had ridden with Michael Fedele, David Martin and William Tong before the Stamford primary, I was ready for a little break and got down to the wire following Summer Rule #13: Bluff Point State Park. As it happened, I was able to make it to Mystic last weekend, where, after a family trip to A Taste of Mystic, my cousin and I raced off in separate cars - he was hitting the park on his way home - to the place we know and love. 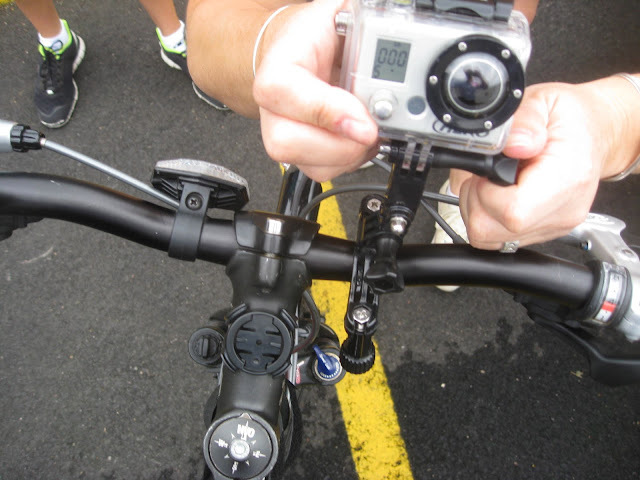 In addition to the mountain bike I built, I brought my GoPro HD Hero 2. If you've got a minute and twenty-two seconds to spare, check out the uncut footage of me following my cousin through singletrack heaven in Bluff Point State Park. I apologize for the Blair Witch Project-like ending. When I reviewed the footage, I realized I was flung from the bike towards the right when the camera violently panned to the left. The video - which my mother didn't like - would be of no use to the NTSB to determine the cause of the crash. Four days and several bandage-changes later, I was heading to the Bedford Street Diner once again on a Cycling With Candidates related mission. For each of the rides one or two journalists covered it (and I thank the Stamford Advocate staff and itsrelevant.com especially). But in the middle of my cycling vacation in California, I was able to connect with Kathryn Hauser, a reporter from News 12 Connecticut. As it turned out, she'd be on vacation once I had returned back from my vacation and wouldn't be able to join me for David Martin's ride, but she wanted to know if I would do an interview. Naturally, I agreed. Cyclists are very effective at talking about the benefits of cycling with other cyclists, so anything I could do to talk about a mode of transport I adore that might be heard by the non-spandex wearing crowd seemed like a good idea. I suggested to Kathryn that she take a ride with me as part of the story - and I told her I'd be able to lend her a bike if she needed. She agreed, and I excitedly emailed her back asking her to tell me her height. Now if you're loaning a bike to someone you've never seen it's an important question. People on TV are either a lot taller or a lot shorter than you expect, and since I thought they wouldn't have a lot of time to do their story I thought it would be best if I brought a bike that was adjusted properly. She gave me her height in a follow-up email. Discovering she was just a few inches shorter than me meant she could easily fit on my Dahon Matrix, the Office Bike or almost any other bike I have. Thankfully, she indicated she could bring her own helmet, which spared me from having to ask something along the lines of: "How big is your head? Is it the size of a volleyball or do you need a spotter to help lift it from the pillow every morning?" It later occurred to me that even if I had engaged in that kind of questioning, I had already destroyed one of my spare helmets in the DIYBIKING.COM Presents: Protect Your Melon post and wouldn't have much I could offer her anyway. The morning of the ride, I realized that I could drive my car to work with the Dahon in the back, retrieve the Office Bike, and drive both to the Bedford Street Diner. Then I remembered the trailer I built for the Domus bike drive - and of course my Sandy Hook/-20- post - and figured it would be a good time to give myself another chance to do what millions should do every day: choose the bike. Yes, you can ride to work if it is safe and you are not too far. Yes, you can ride to the grocery store to buy eggs and bring them all back unbroken. Yes, you can even transport an entire Thanksgiving dinner or move grocery trolleys back to their origin supermarkets. Even though Stamford isn't (yet) the ideal place to ride, you can help make it so by choosing the bike instead of the car, and that's what I decided to do. "That's what this is all about, right?" I asked myself - before responding with a smile. The morning of the Democratic primary, I rode the Dahon to work early with the empty trailer rattling behind me. Unwilling to take the whole apparatus up in the elevator, I locked everything to a railing in the parking garage and headed into the building to get the office bike. Soon after, at a slow and careful pace, I pedaled down Summer Street and took a left onto Hoyt before making another left onto Bedford…coming in to park a good ten minutes before News 12's arrival time. I got the office bike off the trailer and reattached the front wheel before I locked everything up in a place where it would all be out of the way. I sat at the counter where I resisted the temptation of donuts while talking about the bike trailer with the waitress, who was curious about it. A few minutes later, Kathryn entered the diner and introduced herself. We talked about the traffic and the primary before I suggested she head to the back of the diner with me to check out her ride. We quickly determined she'd fit better on the office bike, but she said she wanted to do the interview before riding. Standing on the side of the diner, she had the camera operator attach a cordless microphone, which attached to my belt. I stifled a laugh as I couldn't help thinking about the wireless microphone gag from the first Naked Gun movie. Thankfully, I had already used the bathroom. Next, she let the enormous camera roll while Kathryn asked me a series of questions about Cycling with Candidates and my own history with biking. I hoped my answers would be coherent enough to air. She assured me to just talk, which I am actually pretty good at doing. Then the camera operator did something I wasn't expecting: she attached a GoPro HD Hero to my handlebars. The idea was to get footage of me on the bike from the point of view of the bike. I went along with it, but for the sake of their ratings I hoped they would use as little footage of me as possible. Also, I was a little worried I'd forget the camera was there and go nose spelunking or something. Kathryn and I did two rides together; one with the camera pointed up at me and the other with the camera facing forward so we could capture some of the ride. Two things really made me smile: the first was Kathryn - an experienced cyclist - said she was happy with the quality of the bike I had lent her. The second was that before the trip to Bluff Point I hadn't used my own GoPro in nearly a year, and for the second time in four days, I was riding with one on my handlebars. After we returned to the diner, Kathryn filmed a short teaser for the segment by standing with the office bike and a News 12 microphone in front of Bedford Street while, cued by the camera operator, I rode behind her. "Local blogger and mediocre DIYer wants to make Stamford more bicycle friendly. What that means for your weekend - at five!" She said something like that. I couldn't hear her exact words. Next, I was to ride by myself so Kathryn and the camera operator could get ahead of me in their car and film. The microphone would remain on my waist and the GoPro remained on my handlebars throughout this. The camera operator encouraged me to talk if I thought I was close enough to the car and simply wanted to point out quirks about riding in Stamford. For the most part, since I had trouble finding out where the News 12 car was, I was sure I was mostly talking to myself - or someone with a nearby baby monitor may have picked up some of my chatter as I was riding down Summer Street. "I don't know if anyone can hear me, but this is not only against the law but a pet-peeve. I am at a red light and the woman in the white car behind me has a cell phone pressed to her ear." At the time, it didn't occur to me to get off the bike, turn it around (the GoPro was facing forward) and bust the cell phone-using woman while reciting her license plate number for the cable television audience: "Caught you on tape! How does it feel to be as local as local news gets?!" But I did no such thing, and when light changed the woman's car passed me without incident. She was still on her call. I hope anyone, of any gender, in any car, refrains from using their cell phones for any reason while driving. Minutes later, I met back up with Kathryn and the operator at the diner, and I thanked them both profusely. Realizing I had another chance to get a picture of a professional person on my site wearing a bike helmet, I here present News 12 reporter/anchor Kathryn Hauser. We parted ways so I could reattach the office bike to the trailer and I could ride back to work. Returning that bike to its spot behind my office door, I was once again left with pedaling with the rattling, empty bike trailer all the way home at the end of the day. These things do make a lot of noise when there is nothing in them. Not far from home, I came across someone I could identify with and gave him a friendly nod of solidarity. My mother did like this video - partly because I think it helped her forget the one I had made. Please share the News 12 link with your cycling friends - and better still, your non-cycling friends. And for those of you who have access to a GoPro: it isn't easy to get good footage, but it obviously does help if you are good at editing like Kathryn Hauser and the News 12 team. Once again, I thank Kathryn and News 12: they did inspire me to learn about shooting better footage of my own and I hope the segment they made inspires more people at home to choose the bike and get more involved in making their cities and towns more bike friendly. As always, thanks for reading and thanks for riding.